You’re the happy owner of a set of Kanto speakers. You set them up perfectly taking into account everything you’ve learned from our previous blog post. Everything sounds great and you’re loving how your favorite songs are sounding. You’re even starting to hear new details in songs you’ve listened to hundreds of times before. What if we told you you’re STILL not hearing everything you could? Most speakers are not able to reproduce all the notes and frequencies that humans can hear. Theoretically, if you wanted speakers that could play the lowest note of a pipe organ or simulate the tactile rumble of an explosion, they would have to be huge. You can blame physics for that. Speakers need to move a lot of air through their drivers to generate ultra-low frequencies, and typical bookshelf speakers simply don’t have the size or power to accomplish this. Smaller speakers are appealing to most people for their versatility and compact size, but they’ll never fully cover the lower portion of the audio spectrum that’s so visceral. 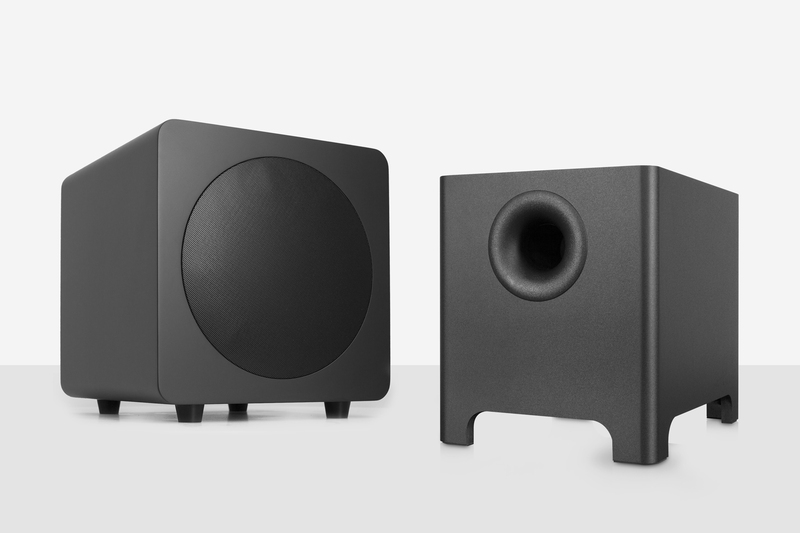 Adding a subwoofer to your existing system is something you may not have considered. You may feel that you aren’t missing out by not hearing the lowest registers of bass because you don’t listen to bass heavy content. You don’t need to be bass-head, or an action movie fan to appreciate the low bass that a subwoofer can reproduce. All modern recordings contain the full spectrum of audio even if the music is not predominately bass driven. Your ears hear the full spectrum of audio every day of your life – having a system that can reproduce everything your ears can hear will add realism and fullness regardless of the content. With a subwoofer, you will be hearing music and movies the way the producers and engineers intended them to be heard. 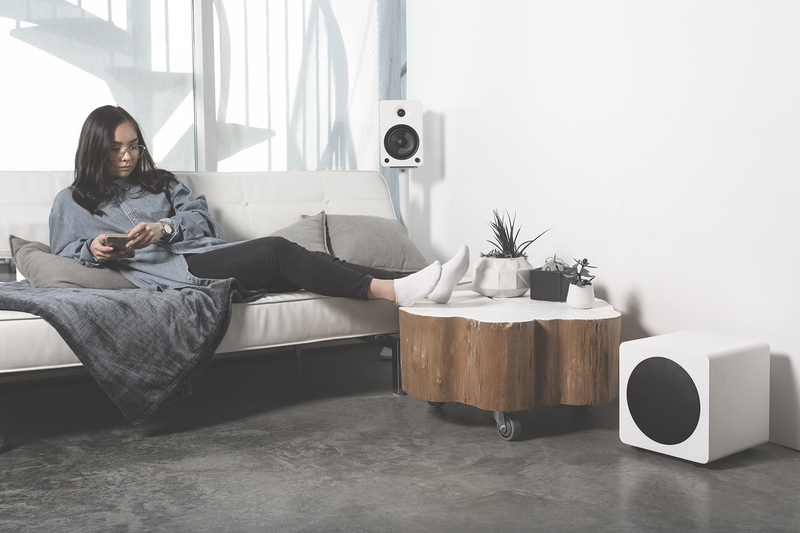 You might be worried your neighbors will complain about the noise a subwoofer can generate. Subwoofers get a bad rap because they’re often heard in poor applications and far too loudly. Many people’s first impressions of subwoofers are based on hearing overblown bass pumped out of custom cars. Others have only had experience with the small bloaty subwoofers that are included with soundbars and all-in-one home theatre systems. The nice thing about owning a subwoofer is that it’s entirely up to you to determine how loud you want it to be. 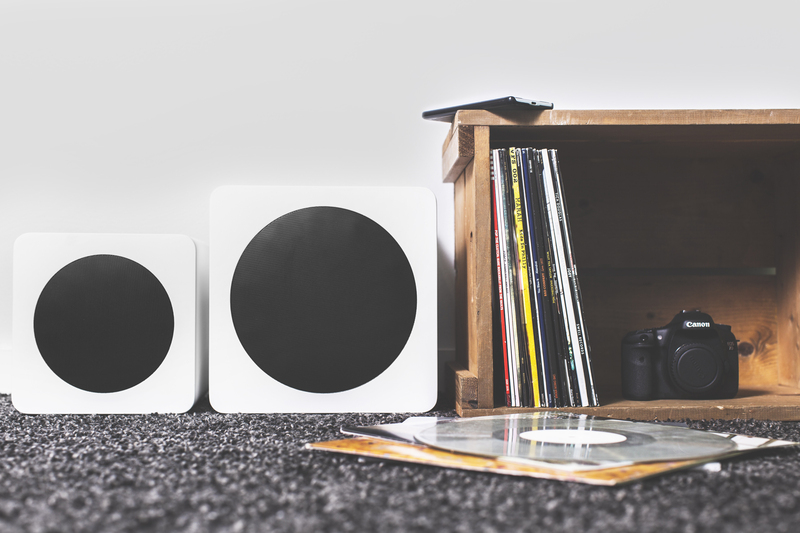 In fact, the ultimate goal of adding a subwoofer into your existing system is to have the subwoofer blend in so well that it disappears into the room. A properly setup sub will add bass extension. An improperly setup sub will only add overwhelming bass. We’ll be focusing on powered subwoofers that do not require an external amplifier. 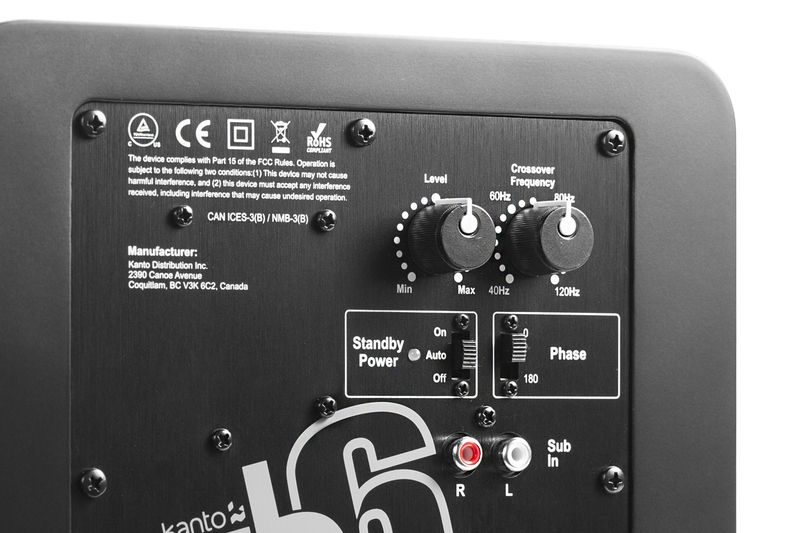 All Kanto speakers have an RCA sub-out so make sure your subwoofer has an RCA input. You’ll also want a sub with a dedicated volume gain adjustment and a crossover/filter adjustment. You’ll need these controls to shape and adjust the subwoofer’s sound, which will become crucial when integrating it with your existing Kanto speakers. More on this later. Room size plays an important role in your choice of a sub. Generally, the larger a room is, the larger the sub will need to be. You need to move enough air to energize the whole space and the surface area of the subwoofer speaker cone is directly related to how much air it can push around. A good starting point is a 6” woofer for a small room, office or bedroom. We suggest an 8” woofer for a medium-sized room, and a 10” woofer for a large open concept room. 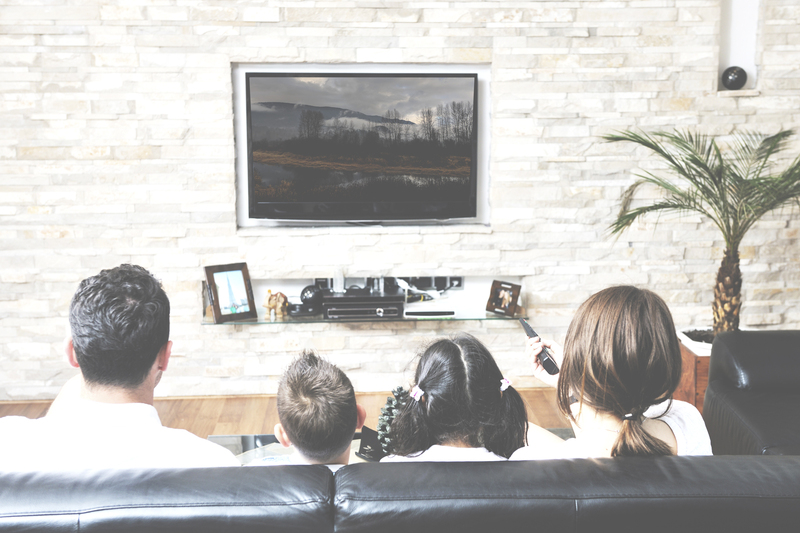 If there are a lot of absorptive materials in the room, such as thick carpeting or plush furniture, you may need to compensate for some of the energy the room will absorb by purchasing a larger subwoofer. It never hurts to “over-purchase” a sub given the fact you can always keep its volume at an appropriately low level. If you “under-purchase”, your subwoofer may struggle to fill the room with sound even when running at full capacity. It may not add much to your experience and can leave you wondering why you even bothered adding a subwoofer in the first place. Wattage is important as well, although there are no hard-set rules about how much wattage you need. Wattage depends on how efficient the subwoofer is, the cabinet or enclosure style, how accurate the manufacturer is with their specifications, and so forth. An 8” subwoofer with a powerful amplifier may be just as capable as a 12” subwoofer with an underpowered amplifier. It’s best to stick with a reputable manufacturer that is well respected with audio enthusiasts than to base your purchase on the amount of wattage the product claims. There are many styles and configurations of subwoofers on the market and it can be difficult to choose which one will work best for your application. Ported subwoofers tend to get louder than sealed subwoofers with the same amount of wattage. They can breathe easier and in turn, are more efficient in turning their power into sound. Their efficiency is the reason why you see more ported subs than sealed subs – manufacturers don’t have to use expensive amplifiers to reach the same volume level. There’s a cost to this efficiency, though. If you push a poorly designed ported subwoofer to its limit, you will hear distortion in the form of buffeting or chuffing noises generated from the port. Some ported subwoofers trade sound quality for volume. Sealed subs can generally be taken to their limit without mechanical noise being introduced. There’s less that a manufacturer can get “wrong” on a sealed sub. It doesn’t have to be engineered or tuned as critically as a ported subwoofer to achieve great sound. Most sealed subwoofers trade volume for sound quality. In applications where clarity and precision are less important, such as gaming and watching movies, a ported subwoofer will suffice. For critical listening, a sealed sub may be the better choice. Keep in mind that a well-designed subwoofer is going to sound good regardless of the style or configuration. You will need to set up your subwoofer to get it sounding as balanced and neutral as possible. You will be listening to the volume of each note in a testing tracks bassline with the goal of getting each note to the same volume level – none over or under emphasized. You will adjust the subwoofers crossover, volume and location to achieve this goal. If done successfully, your guests will gaze upon those two beautiful, compact speakers at the front of your room and wonder how they’re putting out such full, authoritative bass. This song has a looping bassline that runs throughout the whole song, you can jump in at almost any point of the track. The synth-based bassline in this song covers more than a full octave giving you a wide range of notes to listen for. KAYTRANADA – BREAKDANCE LESSON N.1. The bassline of this song changes several times throughout the track. The portion between 2:07 and 2:55 is particularly helpful for testing due to its consistency. The first half of the song digs a bit deeper than the second half. These two different halves will let you test both sub-bass and mid-bass. Although the bass is mixed lower than the rest of the tracks on this list, it’s still useful. The last portion of the song starting at 3:18 contains some nice low notes perfect for testing a subwoofers capabilities. The repetitive climbing bassline in this song is great for determining problem areas of your system where some notes are louder than others. Set the volume of your sub to the halfway point. Set your subs crossover to the recommended frequency provided below. Choose a few spots in your home that would work for sub placement. Place your sub in your first area of choice. While seated, play one of the test tracks and listen for how consistent all of the notes sound. Do not adjust any settings at this point. Place the sub in the next area and have a listen. Choose the location that gave you the most even or consistent sound. Bonus tip: One of the cool things about sub-bass is that it isn’t directional, your ears cannot tell where it’s coming from so you can be flexible in the placement of your sub. Putting it close to a wall or corner will increase bass output, moving it towards the center of the room will reduce volume. Sub-bass interacts with the room even more than speakers do. Continue listening in the area you have chosen. Adjust the volume of the subwoofer if ALL of the notes in the bassline sound too loud or too quiet. Decrease the crossover if just the mid-bass notes are too loud, increase the crossover if the mid-bass notes are too quiet. Continue adjusting the volume and the crossover settings until the bass from the subwoofer and speakers are balanced and cannot be localized to one of the other. Bonus tip: If your subwoofer has a phase switch change it between 0 and 180 and choose whichever sounds better to you. Taking the time to set up your sub properly to hear those notes that you hadn’t heard before is worth the effort. Your ears will most certainly thank you. We’d love to see your setup. Send us a picture on Facebook or Instagram with the hashtag #kantoaudio. Enjoy those sub-bass beats!